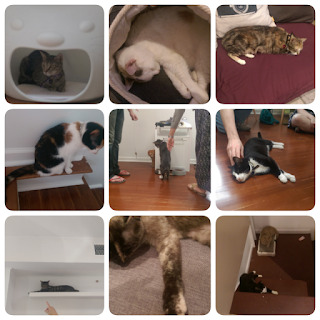 DC now has a cat cafe. Now here's the thing about the cat cafe, it is essentially and in our out type deal. Either a cafe full of cats who may want pets, playtime, or naps sounds great or it doesn't. Since I have already visited, I think which side I fall on is clear. There have been quite a few articles about the opening. Also, as to the cafe part, the food is actually prepared across the street, they basically have a deal with the cafe and take your order and run across and get it for you. So no onsite kitchen, no worries about food prep. There are two levels open to the visitors, with a third for employees and for the cats who may decide they have had enough. There are chairs and lots of cat friendly furniture. Many of the chairs are low to the ground to encourage cat human interaction. There are also some high shelves for cats who may feel that they wish to observe the hums from on high. I was there mid-day so some of the cats were still playful, but quite a few were ready for nap time or pets. Or sometimes both. Two cats had moved to the human bathroom, perhaps due to the cooler tile floors, or perhaps to have a better vantage for human invaders. There was a tiny bit of hissing, over some territory, but nothing that I saw damaged either humans or cats, although one cat did hunker down in the litterbox. (He was still friendly to the humans.) Humans were also fun to observe. Some were playful, some stuck to one cat and tried to form deep bonds, and some tried picking up all the cats to see how they did with that. All the cats are available for adoption, and so hopefully some of them won't be back the next time I visit. And yes, part of me did wonder why I was leaving my cat to go visit others, but hey, it was a totally platonic visit, it meant nothing! Just harmless fun hanging with some other cats.